COMFORTABLE MARCH AFTERNOON: The sky is partially sunny across Alabama this afternoon; temperatures are mostly in the 60s. 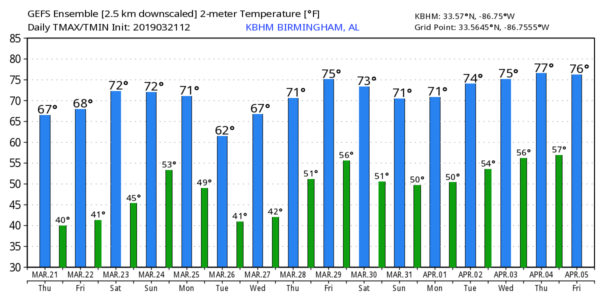 The average high for today at Birmingham is 68. Tonight will be fair and cold; most communities will reach the upper 30s early Friday morning. FRIDAY AND THE WEEKEND: Look for sunshine in full supply Friday and Saturday with afternoon highs between 67 and 70 degrees. Saturday morning will be pretty chilly, however, with early-morning lows in the mid to upper 30s. Sunday will be dry and mild; with a partly sunny sky temperatures will reach the mid 70s. Clouds will then increase statewide Sunday night. NEXT WEEK: The next rain maker for Alabama arrives Monday. We expect periods of rain, and possibly a thunderstorm; rain amounts should be one-half inch or less. No severe storms are expected. The rest of the week looks dry; Tuesday will be colder, and by early Wednesday morning many north and central Alabama communities could reach the low to mid 30s. But we warm up nicely during the day Wednesday, with a high close to 70. Low to mid 70s are likely Thursday and Friday. ON THIS DATE IN 1932: The March 21, 1932, generational tornado outbreak unfolded across Alabama. At least 36 tornadoes, including 27 killers and several long-lived tornado families, occurred across the Deep South, and Alabama was the hardest hit. The March 24 headline of The Tuscaloosa News stated that the death toll rose to 300, 32 of whom had died in Northport, and 2,500 were known to be injured. The Red Cross worked tirelessly to rehabilitate approximately “10,000 people left homeless in Alabama, Georgia and Tennessee.” According to The Tuscaloosa News, in Alabama alone, there were more than “8,000 whose domiciles were blown to the four winds.” Quite frankly, to this day, we don’t know the exact number of people who died. Keep in mind there were no tornado warnings in 1932. Chilton County was hit extremely hard, with 58 people killed. The Union Grove community near Jemison was laid to waste. Doctors and nurses from Montgomery and Birmingham worked all night by lantern and flashlight to relieve the widespead suffering. In Clay County, one of the tornadoes remained on the ground for 30 miles, cutting a path 400 yards wide. A new automobile became airborne and was carried through the air for a distance of 400 yards. Twelve people died in Clay County and 200 were injured. After the tornado, people were living in the Clay County Courthouse. The best chance of severe storms will be over the southern third of Alabama. We expect a high in the low to mid 80s this afternoon. Tonight will be mostly fair with a low close to 60 degrees.